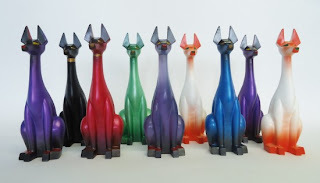 Argonaut Resins will be releasing their 3rd series of Pharaoh Hounds on Wednesday, June 6th at 9am. I'm keeping this post simple because you are now going to need to go and exercise your mouse clicking abilities. These things sell out almost instantly every time there's a new release, so you're gonna have to be on top of your game if you want to score one. Do you have the mental and physical toughness required to obtain one of these figures? Bookmark http://argonautresins.bigcartel.com/ right now so you'll be ready.